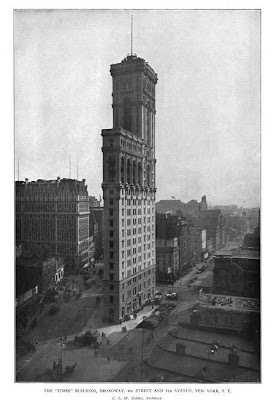 The New York Times Building or One Times Square designed by Eidlitz & MacKenzie c. 1903 at No. 1 Times Square in New York City. The building underwent alterations in 1963 and 1975. Click HERE for more on the Times Building. Photo from American Architect & Architecture, 1905. This really should be listed under demolished. Except for its steel framing, everything that was wonderful about this once slender skyscraper was destroyed long ago. A nice comparison could once be made with the Flatiron Building. Just think -- If the Sulzbergers had had the wit to hold onto this, there might still be some part of the company that was profitable.